Spotted-wing drosophila (SWD), Drosophila suzukii is an invasive pest that attacks many cultivated and wild fruits. With the help of a strong, saw-like ovipositor or egg laying appendage, SWD is able to deposit eggs in ripe and occasionally in unripe or developing fruit unlike other Drosophila spp., commonly known as vinegar flies or fruit flies, that attack ripe or fallen fruit. Larvae develop in the fruit and pupation occurs either in or outside the fruit. Blueberry, caneberries, cherry, peach, and strawberry are some of the commercially important fruit crops that are at a risk of SWD damage. Monitoring with lures, application of pesticides, use of exclusion netting, and sanitation are some of the control practices currently adopted in organic and conventional crops. Among the microbial control options, entomopathogenic fungi such as Beauveria bassiana, Isaria fumosorosea, and Metarhizium brunneum (=M. anisopliae) against adults and entomopathogenic nematodes such as Heterorhabditis spp. and Steinernema spp. against pupae in the soil can be potential choices. A few lab studies that evaluated these options showed limited efficacy of the most except for B. bassiana treatments in Italy and M. brunneum in Oregon that appeared promising (Gargani et al., 2013; Cuthbertson et al., 2014; Woltz et al., 2015). Biocontrol potential with predators and parasitoids is also limited based on current research data (Haye et al., 2015; Renkema et al, 2015; Woltz et al., 2015). 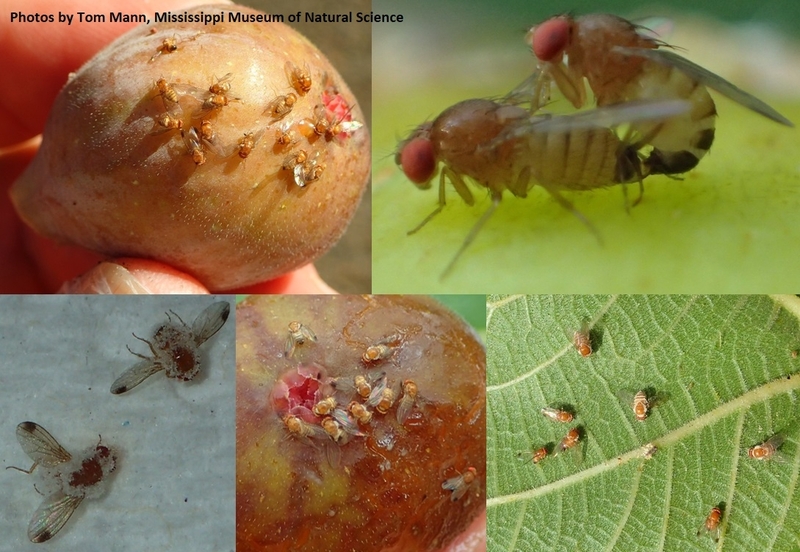 In light of limited microbial and biocontrol control agents, a recent outbreak of fungal epizootics in SWD on fig offers a potential natural control option. SWD populations in a small fig orchard in Clinton, Mississippi were infected by a fungus in June, 2017. Unusually cool and wet conditions caused epizootics of a fungus, which was later identified by Connecticut Agricultural Experiment Station scientists as Entomophthora muscae or a closely related species. SWD first appeared in blueberry, blackberry, and mulberry plots of this orchard in 2012 and infestations on figs were noticed only in 2017. Other SWD hosts that are grown at this orchard include grapes, pears, and strawberries. Having a variety of hosts with extended availability of fruits could have supported SWD populations at this location. Unlike B. bassiana, I. fumosorosea, and M. brunneum (Phylum Ascomycota: Class Sordariomycetes: Order Hypocreales), Entomophthora spp. belong to a different fungal group (Phylum Zygomycota: Class Entomophthoromycetes: Order Entomophthorales). Entomophthora spp. cause disease outbreaks in their host populations when environmental conditions are favorable with high humidity and low temperature aided by high host densities. Entomophthora muscae is considered to be a species complex infecting a variety of dipteran families including Drosophilidae (Goldstein, 1927; MacLeod et al., 1976; Gryganskyi et al., 2013). However, it appeared to be less pathogenic to the common fruit fly, Drosophila melanogaster compared to other dipteran species (Steinkraus and Kramer, 1987). Entomopathogenic fungi typically take 3-5 days to kill their hosts. Infection process typically starts when host insect comes in contact with the conidia (asexual spores) of the fungus (Brobyn and Wilding, 1983). Primary conidia either produce a germ-tube that penetrates through the host cuticle or produce secondary conidia (which later produce germ-tubes) or hyphae. Both enzymatic degradation of cuticle and mechanical pressure by the penetration peg of the germ-tube aid in fungus gaining entry into the host body. Hyphal bodies are formed inside the host, invade the fat bodies and other tissues, and eventually cause death of the host insect. The fungus later emerges from the intersegmental membranes and conidiophores or spore bearing structures produce conidia that are dispersed to continue the infection cycle. Infected flies become sluggish and typically fly to the higher parts of the plant canopy where they become attached to plant surfaces with rhizoids (peg like structures that emerge from the ventral or lower side of the insect body) and sticky secretions (Steinkraus and Kramer, 1987). This process increases the chances of disease spread as insect cadavers are securely attached to plant surfaces and infective conidia are dispersed from a higher elevation in the canopy. When host populations diminish and during the winter months, entomophthoralean fungi may produce environmentally resilient resting spores to survive cold winters (Eilenberg and Michelsen, 1999) or survive as hyphal bodies in the dead (Keller, 1987) or winter hosts (Klingen et al., 2008). Other overwintering options for these fungi include infections in their host insects on winter crops (Dara and Semtner, 2001) or infections in alternative host insects (Eilenberg et al., 2013). Entomophthoralean fungi are difficult to culture in vitro and do not have the biopesticide potential as the hypocrealean fungi. However, they can be significant mortality factors in some areas and bring down high host populations. Neozygites fresenii epizootics in cotton aphid, Aphis gossypii (Steinkraus et al., 1995), Entomophaga maimaiga in gypsy moth, Lymantria dispar (Hajek and Elkinton, 1991), and Pandora neoaphidis in green peach aphid, Myzus persicae populations (Dara and Semtner, 2007) are some of the examples for the natural control of insects by entomophthoralean fungi. Anecdotal reports indicated outbreaks of a possible entomophthoralean fungus in aphids on some vegetables in California, but there are no published reports of fungal outbreaks except for a study in the 1980s. Mullens et al. (1987) reported E. muscae epizootics in house fly (Musca domestica), little house fly (Fannia canicularis), and predatory fly (Ophyra aenescens) populations in Southern California poultry facilities. Similarly, E. muscae infections in adult onion fly (Delia antiqua) and seed corn maggot (D. platura) caused significant population reductions in Michigan (Carruthers et al., 1985). In a recent study in North Carolina, E. muscae infected both cabbage maggot (D. radicum) and a predatory fly (Coenosia tigrina). The extent of E. muscae epizootics in Mississippi populations of SWD show promise for the natural control of this pest. While large scale in vitro production of the fungus may not be practical at this moment, small scale production in vivo or a specialized culture medium is possible for laboratory and greenhouse studies. In vivo culturing of entomophthoralean fungi and releasing infected live arthropods was successful for a large scale release of Neozygites tanajoa for controlling the cassava green mite, Mononychellus tanajoae in West Africa (Hountondji et al., 2002) and a small scale release of P. neoaphidis for controlling M. persicae in Virginia (Dara and Semtner, 2006). Future studies will shed light on the potential of E. muscae in SWD integrated pest management. Brobyn, P. J. and N. Wilding. 1983. Invasive and developmental processes of Entomophthora muscae infecting houseflies (Musca domestica). Trans. Br. Mycol. Soc. 80: 1-8. Carruthers, R., D. L. Haynes, and D. M. MacLeod. 1985. Entomophthora muscae (Entomophthorales: Entomophthoraceae) mycosis in the onion fly, Delia antiqua (Diptera: Anthomyiidae). J. Invertebr. Pathol. 45: 81-93. Cuthbertson, A.G.S., D. A. Collins, L. F. Blackburn, N. Audsley, and H. A. Bell. 2014. Preliminary screening of potential control products against Drosophila suzukii. Insects 5: 488-498. Dara, S. K. and P. J. Semtner. 2001. Incidence of Pandora neoaphidis (Zygomycetes: Entomophthorales) in the Myzus persicae (Sulzer) complex (Homoptera: Aphididae) on three species of Brassica in the fall and winter. J. Entomol. Sci. 36: 152-161. Dara, S. K. and P. J. Semtner. 2006. Introducing Pandora neoaphidis (Zygomycetes: Entomophthorales) into populations of Myzus persicae ss. nicotianae (Homoptera: Aphididae) on flue-cured tobacco. J. Agric. Urban Entomol. 22: 173-180. Dara, S. K. and P. J. Semtner. 2007. Within-plant distribution of Pandora neoaphidis (Zygomycetes: Entomophthorales) in populations of the tobacco-feeding form of Myzus persicae (Homoptera: Aphididae) on flue-cured tobacco. J. Agric. Urban Entomol. 23: 65-76. Eilenberg, J. and V. Michelsen. 1999. Natural host range and prevalence of the genus Strongwellsea (Zygomycota: Entomophthorales) in Denmark. J. Invertebr. Pathol. 73: 189-198. Eilenberg, J., L. Thomsen, and A. B. Jensen. 2013. A third way for entomophthoralean fungi to survive the winter: slow disease transmission between individuals of the hibernating host. Insects 4: 392-403. Gargani, E., F. Tarchi, R. Frosinini, G. Mazza, and S. Simoni. 2013. Notes on Drosophila suzukii Matsumura (Diptera Drosophiliae): field survey in Tuscany and laboratory evaluation of organic products. Redia 96: 85-90. Goldstein, B. 1927. An Empusa disease of Drosophila. Mycologia 19: 97-109. Gryganskyi, A. P., R. A. Humber, J. E. Stajich, B. Mullens, I. M. Anishchenko, and R. Vilgalys. 2013. Sequential utilization of hosts from different fly families by genetically distinct, sympatric populations within the Entomophthora muscae species complex. PLoS ONE 8(8): e71168. Doi:10:1371/journal.pone.0071168. Hajek, A. E. and J. S. Elkinton. 1991. Entomophaga maimaiga panzootic in northeastern gypsy moth populations. In: Gottschalk, Kurt W.; Twery, Mark J.; Smith, Shirley I., eds. Proceedings, U.S. Department of Agriculture interagency gypsy moth research review 1990; East Windsor, CT. Gen. Tech. Rep. NE-146. Radnor, PA: U.S. Department of Agriculture, Forest Service, Northeastern Forest Experiment Station: 45. Haye, T., P. Girod, A.G.S. Cuthbertson, X. G. Wang, K. M. Daane, K. A. Hoelmer, C. Baroffio, J. P. Zhang, and N. Desneux. 2016. Current SWD IPM tactics and their practitcal implementation in fruit crops across different regions around the world. J. Pest Sci. 89: 643-651. Hountondji, F.C.C., C. J. Lomer, R. Hanna, A. J. Cherry, and S. K. Dara. 2002. Field evaluation of Brazilian isolates of Neozygites floridana (Entomophthorales: Neozygitaceae) for the microbial control of cassava green mite in Benin, West Africa. Biocon. Sci. Tech. 12: 361-370. Keller, S. 1987. Observations on the overwintering of Entomophthora planchoniana. J. Invertebr. Pathol. 50: 333-335. Klingen, I., G. Waersted, and K. Westrum. 2008. Overwintering and prevalence of Neozygites floridana (Zygomycetes: Neozygitaceae) in hibernating females of Tetranychus urticae (Acari: Tetranychidae) under cold climatic conditions in strawberries. Exp. Appl. Acarol. 46: 231-245. MacLeod, D. M., E. Müller Kögler, and N. Wilding. 1976. Entomophthora species with E. muscae-like conidia. Mycologia 68: 1–29. Mullens, B. A., J. L. Rodriguez, and J. A. Meyer. 1987. An epizootiological study of Entomophthora muscae in muscoid fly populations on Southern California poultry facilities. Hilgardia 55: 1-41. Renkema, J. M., Z. Tefer, T. Gariepy, and R. H. Hallett. 2015. Dalotia coriaria as a predator of Drosophila suzukii: functional responses, reduced fruit infestation and molecular diagnostics. Biol. Control 89: 1-10. Steinkraus, D. C., R. Hollingsworth, and P. H. Slaymakeh. 1995. Prevalence off Neozygites fresenii (Entomophthorales: Neozygitaceae) on cotton aphids (Homoptera: Aphididae) in Arkansas cotton. Environ. Entomol. 24: 465-474. Steinkraus, D. C. and J. P. Kramer. 1987. Susceptibility of sixteen species of Diptera to the fungal pathogen Entomophthora muscae (Zygomycetes: Entomophthoraceae). Mycopathologia 100: 55-63. Woltz, J. M., K. M. Donahue, D. J. Bruck, and J. C. Lee. 2015. Efficacy of commercially available predators, nematodes, and fungal entomopathogens for augmentative control of Drosophila suzukii. J. Appl. Entomol. 139: 759-770.